Max Verstappen has won the Austrian Grand Prix, making it a top party for Red Bull Racing at their home venue. In a race where blistering and retirements ruled the day, Verstappen remained out of trouble while Raikkonen and Vettel joined him on the podium in second and third. As the lights went out, Raikkonen had the best getaway, with Bottas probably the worse of the top 3. When they arrived at Turn 1 for the first time, the three were abreast, with Hamilton ending up ahead thanks to being on the inside line of the corner. Raikkonen followed in second while Bottas dropped to 4th due to the disadvantages of the outside line. Vettel, starting from 7th due to a 3-place grid penalty for hindering Sainz during qualifying, wasn't messing about either. After a fairly conservative start, he decisively got ahead od Grosjean for 6th on lap 7. On lap 11, Alonso vented his frustration over the radio. While driving almost last - ahead only of team mate Vandoorne who pitted on lap 1, he noted "You'd better start thinking about strategy, because I'm not going to drive here in this position for 71 laps". Lap 13 marks the first retirement as Hulkenberg is forced to park his car, after his engine decides to give up on him with a huge white cloud of smoke. By the time he went off the track at Turn 1, fire was clearly visible. Two laps later, Bottas also retires, although less spectacularly. While accellerating out of Turn 3, the Finn reported "my gearbox is gone", so he parked at Turn 5. The virtual safety car instated on lap 15 resulting in numerous pitstops, including tyre changes for Verstappen, Raikkonen, Ricciardo, Vettel, Grosjean, Ocon, Sainz, Stroll, Gasly, Leclerc and Alonso. From the top 10, only Hamilton, Magnussen and Perez had not pitted. Hamilton was on used super softs, Magnussen on used ultra softs and Perez on new super softs. With the racing back on, Hamilton was 13s ahead of Verstappen, but almost on identical pace. Ricciardo moved up into third 2 laps after the restart thanks to a clean move in Turn 5. On lap 25, Hamilton pitted while still only 13s ahead of Verstappen. This obviously saw his drop down the pecking order, into 4th, exactly halfway in between Raikkonen and Vettel. 5 laps later, Ricciardo's tyres started blistering, while Raikkonen began pushing to keep Hamilton behind. This resulted in a close pack of three cars while Vettel almost unnoticeably snuck up behind as well. On lap 38, Raikkonen makes it past Ricciardo for second, with the latter soon reporting "it's getting very difficult now with the blistering". Indeed, he dove into the pits right after to change to super softs, just like Sainz had done 5 laps before him. One lap later, Vettel got past Hamilton, with the latter also suffering from tyre blistering. Pirelli had expected a straight forward one-stop strategy for the entire field, but clearly the blistering was deciding otherwise. The pass increasing the annoyance of Hamilton as he continued to question his team about not pitting under the VSC. He was eventually told "It was my call, but now please focus on the race. We believe you can still recover from this". On lap 51, after Hamilton reported "I don't know what to say to you guys, my rears aren't going to last", he pitted to change to super softs. He rejoined the race just behind Ricciardo. The Australian however didn't put up a fight, and parked his car after Turn 1. 3 laps later, Hartley also encountered an issue with his car and parked ahead of Turn 3. On lap 62, more trouble hit Mercedes as Hamilton "lost drive", and parked between Turn 3 and Turn 4. The race wasn't really going their way, but a double retirement is something that nobody saw coming. At the same time, Alonso was improving the situation for him and McLaren, with the Spaniard overtaking Leclerc and Gasly to move up into 8th. 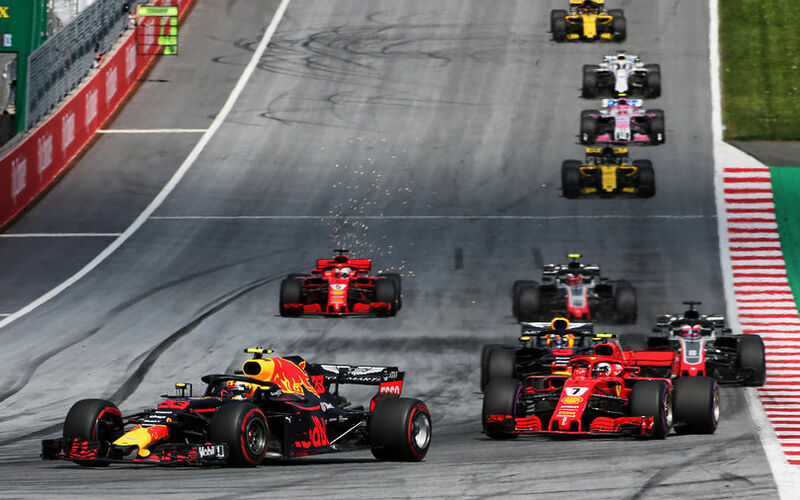 At the front, Verstappen had no competition and went on to win the Austrian Grand Prix. Raikkonen finished second with the fastest lap while Vettel completed the podium for Ferrari.